« California’s budget is not about resistance. It’s about resilience. NOAA’s coastal flood exposure mapper shows flood risks in different parts of the country. NOAA’s Coastal Flood Exposure Mapper uses satellite images to map and identify risks and vulnerabilities caused by coastal flooding. Its exposure feature allows users to see how floodwaters might impact specific communities, vulnerable infrastructure assets, sensitive ecosystems and potential pollution sources. All maps and related data are available to the public and have sharing features that allow communication and engagement between stakeholders and community members. 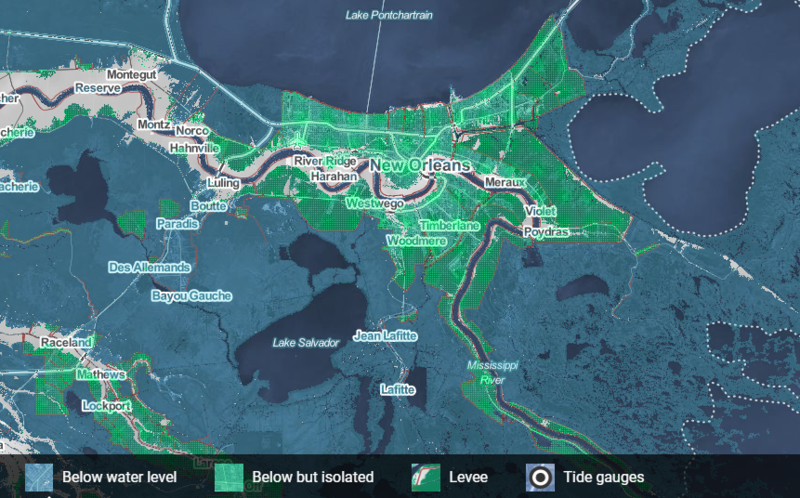 The Louisiana Coastal Protection and Restoration Authority’s master plan data viewer allows coastal residents to explore how the state’s Coastal Master Plan will alter flooding location, frequency and depth. It incorporates current conditions in addition to a variety of scenarios for future relative sea level rise and storm events. Users can easily search for a specific location to discover the depth of flooding and its economic impact. The tool provides valuable insights on community vulnerability, land change, economic damages, and the effects of mitigation and adaptation practices, such as wetland restoration. 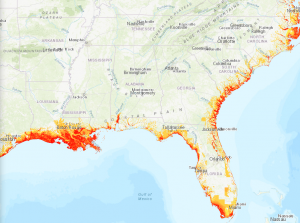 Climate Central’s Surging Seas website offers several mapping tools including the Risk Zone Map, Risk Finder and Mapping Choices that use a combination of NASA satellite data and NOAA high-resolution, high-accuracy lidar elevation data to show inundation risk for all of the world’s coastlines. Not only do these tools help identify locations vulnerable to storm surges and tides – they also serve as a powerful tool for envisioning what our coasts will look like after long-term sea level rise. In addition to NASA and NOAA data, these tools draw on other federal data sources, including the Census Bureau, FEMA, USGS, EPA, and the U.S. Departments of Energy, Interior and Transportation. A map of chronically inundated areas in Charleston, South Carolina. 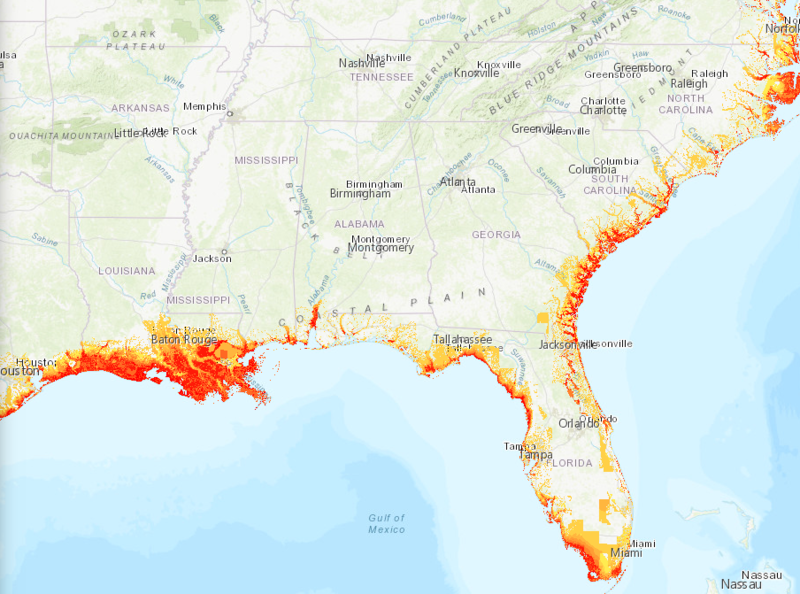 Released last year, the Union of Concerned Scientists’ interactive map allows users to draw insights on chronically inundated areas under various sea level rise scenarios. This data is especially critical for those communities that have 20 years or less to prepare before rising seas begin to have regular impacts on homes, neighborhoods and families – communities like Charleston, South Carolina and Galveston County, Texas. In addition to displaying flooding scenarios, the map highlights communities that would especially benefit from rapid emissions reductions in an attempt to incite action to mitigate climate change. 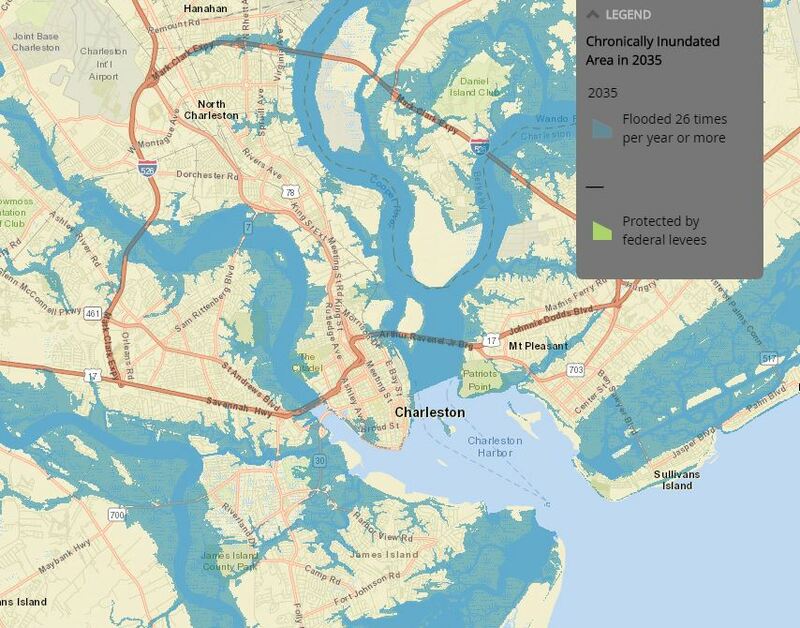 The Nature Conservancy developed its Coastal Resilience mapping portal to serve as an online decision support tool for communities as they plan for the future. It helps communities pull together the best available science and local data to better visualize the risks imposed by sea level rise and storm surge, and identify nature-based solutions for enhancing resilience and reducing risks where possible. A team of practitioners around the world aids in supporting and updating this tool to provide current and accurate data for hazard mitigation and climate adaptation planning. While these tools are incredibly helpful, more value needs to be placed on providing accurate, timely and reliable data in a manner that is understandable and usable by those who need it most – individuals, community leaders and decision makers. Coasts are complicated and so are coastal storms. We need tools for coastal watersheds that bring together risks from all flooding sources, including riparian flooding, urban runoff, storm surge and sea level rise. Especially in extreme storms, coastal communities are affected by all of these, often simultaneously. The next generation of tools needs to help communities explore how various solutions like natural infrastructure, building codes and zoning work individually and together to reduce the economic, social and environmental costs of flood disasters. This will help communities find the right combination of solutions that reflect their values and desired quality of life. Ultimately, smarter tools can help us make smarter decisions for our coasts. Moving forward, collaborative efforts between the public and private sectors could yield even smarter and more powerful tools that inform and inspire actions to reduce vulnerability to growing risks of floods and the costly damages associated with a changing climate. This entry was posted in Coasts and tagged Census Bureau, coastal protection, coastal resilience, coastal restoration, department of energy, department of interior, department of transportation, FEMA, flood, flood protection, flooding map, inundation risk, NASA, NOAA, resilience planning, sea level rise, storm surges, UCS, USGS, water use. Bookmark the permalink. Both comments and trackbacks are currently closed.